In the current world of hacking, ransomware, and phishing scams, more and more emphasis is being placed on cyber security and understandably so. With over 693,000 small to medium sized businesses falling victim to cyber crime at an average cost of $276,000, it’s a huge problem. That said, physical issues such as vandalism, internal theft, and burglary still manage to cost businesses over $1.4 billion every year and is on the increase. With that in mind, maintaining a physical presence is just as important today as it was a decade or so ago. However while the benefits of implementing physical security are clear, few companies really know where to begin. With this in mind, here are some simple but concrete steps that businesses can take to ensure they remain secure. One of the most effective ways to implement premises security is by controlling entry. Going beyond the traditional lock and key and implementing access cards may be costly, but it provides a number of advantages. Keys can easily be cut and duplicated while cards on the other hand are much harder to copy. If someone’s access has to be revoked for whatever reason there is zero need to change locks or even access codes. Instead, simply change the data base. Visitors and/or contractors have the perfect opportunity to cause damage to your business should they wish to do so. If left to their own devices it’s easy for them to wander around the premises where they shouldn’t be. 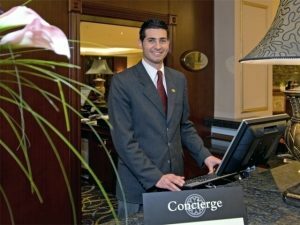 A concierge security service can put a stop to that by acting as reception come security. They become the first point of contact the visitor/contractor sees and by getting them to sign in and issue them with a pass, it’s easy to check who is in the building at any given time. A businesses physical perimeter is normally the first place that criminals will try to spot a weakness. In most cases these types of crimes aren’t normally impromptu. On the contrary most burglaries of this nature are planned weeks in advance. If a business has regular security who patrol the area, either through employed guards or through outsourced security patrols, it immediately makes for a harder target. Not only does physical security act as a deterrent but most security personnel are trained to spot weak points and report them where necessary. As you can see, physical security is crucial to any business and as such can go a long way in ensuring that your organisation doesn’t become part of an expensive statistic. For further information on how our security guards can help your business and give you peace of mind, contact MA security today on 1300 020 406.